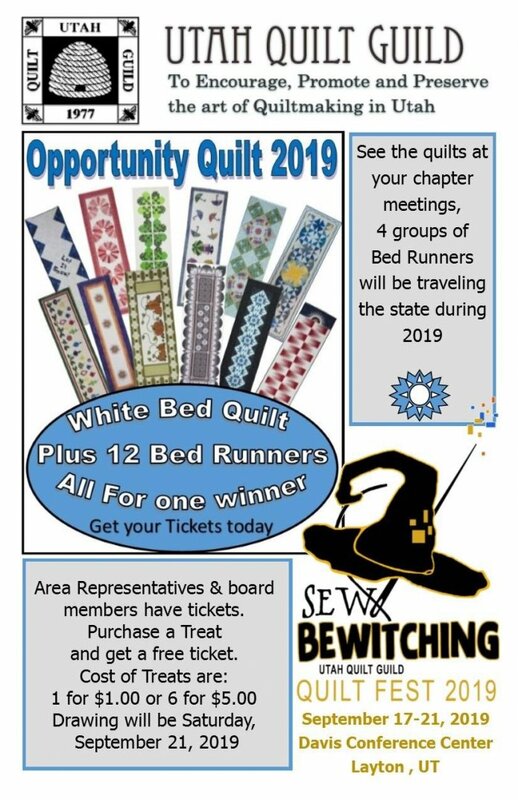 Have you heard, the 2019 Opportunity Quilt is a white bed quilt, made by Josephine Keasler, with 12, monthly-themed bed runners made by prominent (and generous) local quilters. Throughout the year, the Area Reps will be taking the quilt to as many Chapters as they can reach and will be selling tickets …oh, I mean candy … for the chance to win this quilt for your very own. Tickets, er Candy will also be available at the UQSM show in May and at Quilt Fest in September. Candy is $1 a piece or 6 for $5 (with one FREE ticket for each piece of candy purchased). The drawing will be held on Saturday, September 21, 2019. Support the Utah Quilt Guild buying candy and you could bring this quilt and all of these beautiful bed runners home with you!! A while back, I gave everyone the good news about Smiths Food & Drug agreeing to be a sponsor for the Utah Quilt Guild. It is now time to link your Smiths card to the Utah Quilt Guild. You need to do this on your computer and it will only take about 1 minute. By linking your Smiths card to the Guild we will receive a percentage of sales that all linked Utah Quilt Guild members spend. This does not affect your personal Smiths coupons or fuel points. We will earn rewards on almost everything you buy at Smiths. Your Area Reps have step by step instructions they will provide at your Chapter meetings, along with some easy reference handouts. In the meantime if you would like to get started here are the 3 simple steps to get your Smiths card linked to the Quilt Guild account. 2. Sign in to your online account, or create an account if you do not have one. 3. Update your Account Summary, find and select our organization and click "Save"
Our Organization is Utah Quilt Guild, organization #78358. Do You Know About the Amazon Smile Foundation? The Amazon Smile Foundation donates 0.05% of the purchase price from your eligible purchases. The Utah Quilt Guild has been approved to participate in this program. Instead of signing into amazon.com, simply sign into smile.amazon.com. Once you are signed in simply chose the Utah Quilt Guild as your charitable choice. The charitable choice drop down box is on the bottom right side of the page. Your friends and families may also use the smile.amazon.com website and make their charitable choice as the Utah Quilt Guild as well.